This fabric softener uses three simple ingredients. You'll soften clothes, reduce static and save money all at the same time! In a large bowl, add hair conditioner to hot water and stir gently to combine. Add white vinegar and stir gently to combine. 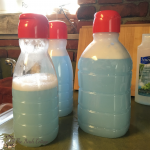 Pour fabric softener solution into bottle. Follow manufacturer's instructions for adding liquid fabric softener to your washing machine.